Scrumpy & Western website. Made In Somerset from cider! The Beautiful Changers band page. "THE Pete Atkin tribute band!" Why are they called The Beautiful Changers? Isn't it obvious by looking at them? No? ...well, they took their name from the Pete Atkin / Clive James song The Beautiful Changes which was featured on the eponymous 1970 Julie Covington album - which incidentally is currently available in the shops! The Beautiful Changers can justly claim to be among the world's first bands to form over the Internet! They were formed by a group of Pete Atkin fans who were all members of the Midnight Voices, a discussion group formed by Pete's number one fan Steve Birkill, who started the celebrated Smash Flops website devoted to the works of Pete Atkin and Clive James (see also the Scrumpy 'n' Western Pete Atkin page for a brief introduction to Pete). To cut a long story short: thanks largely to Steve and his untiring efforts, a Pete Atkin concert was arranged for the summer of 1999 - to become known as FoD 99 - see below for more on this! A bunch of Midnight Voices decided to form a tribute band to open for Pete at the gig. Some of the band members had previously only "met" over the internet - although most of them had been to one or more of the various Pete Atkin events organised by Steve over the previous few years, or at Pete's few sporadic gigs in folk clubs over the same period. Because the band members are based in diverse parts of the UK - including the West Country, London, the Home Counties, the Midlands and Scotland - getting together for rehearsals presents a bit of a problem! Not only that, but they all (still!) have day jobs and family commitments, etc., which makes it difficult to arrange mutually convenient dates. In spite of this they managed to get together for two rehearsals prior to the FoD 99 gig, plus a final rehearsal at Monyash the day before the event. So please make allowances when you hear them! And you can do this right here - listen to the audio clips below! What's their story so far? The band got together in April 1999, the intention being to perform some of Pete Atkin's songs. Their first appearance was before an invited audience at the 1999 Pete Atkin Field of Dreams (FoD 99) gig at Monyash, Derbyshire, UK, on 17 July 1999. The band's second appearance was at the Pete Atkin School of Dreams (SoD 2K) gig at Milton Keynes, Bucks, UK on 21 October 2000. The two high points of their career were being invited on stage to accompany Pete on the song Rain-Wheels at the end of his triumphant return to Monyash, and again at the SoD event in Milton Keynes, this time to accompany Pete on I See The Joker. The band was also mentioned in PC Format magazine in May 2000. There is a review of the Beautiful Changers' performance at the FoD 99 gig on the Pete Atkin website! The band are planning to continue to perform and record on an occasional basis. Although the band has so far concentrated on the works of Atkin / James, they intend to expand into other areas of music. 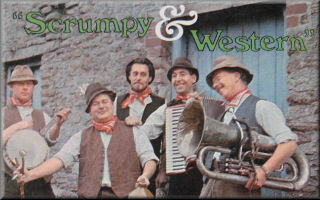 As a few of their members are Scrumpy 'n' Western fans, you might even hear the odd Wurzels number - you never know... Watch this space for news! Update (January 2000): The band have had one full rehearsal since FoD 99 and a few of the members got together before that. They have been working on improving their arrangements of some of the successful numbers from the Monyash gig, as well as working on some more Atkin/James material. Update (July 2000): The Beautiful Changers got together on Sunday 23rd July for their first practice together (or in some cases, at all!) for well over six months. Their next appearance is scheduled for October 21st at the SoD 2K event, organised by Andy Love. The practice was a great success and the band worked on the numbers they intend to do at the gig. The line-up features the same personnel, but the instrumentation has been augmented since last year, with the band members sharing duties in what they hope will be more 'professional' arrangements. The main changes have been in the keyboard, bass and guitar parts - the two keyboardists Ian and Leslie have upgraded their instruments (don't get alarmed, missus! ); Sylfest has taken up bass guitar and will share duties with Roy, allowing the latter more chance to take the lead vocals; and Paul has taken up electric guitar and has been pushed into the 'Eric Clapton-in-Gordano' lead guitar slot (or should that be 'leaden'?!) - anything to stop him attempting to sing! So whatever happens at SoD 2K, the audience is guaranteed something different from last year! Leslie will continue on rhythm guitar on some numbers, while Ben will again be their lead singer and John the drummer. Update (October 2000): Little did I know when I wrote above "whatever happens at SoD 2K, the audience is guaranteed something different from last year" how true those words would be! The band performed at Andy Love's SoD2K event as planned, but there were a few hitches! Firstly, lead vocalist Ben Coulson and John Denton (drums) failed to turn up. Richard Corfield was also unable to attend. On top of this, because Wizz Jones phoned ahead to say he would arrive late, the band had to go on early, so prior to this a hurried conference was held to decide what to do. The Changers decided the show must go on, and changed the running order to allow them to share vocal duties to cover for Ben. The biggest problem, however, was the lack of a drummer. An appeal to the audience "Is there a drummer in the house?" was unsuccessful, as none of the audience would admit to an acquaintance with the sticks. Unfortunately, the Jokers' drummer Oliver Ash arrived too late to be able to sit in. So the Changers had to use Ian's keyboard to provide the rhythm where necessary. All in all, a bit of a nightmare - and not only for the audience! Have they made any recordings? So far they have made a limited edition CD For Pete's Sake!, clearly destined to become a collectors' item in years to come - hopefully not too many years, as one or two of the band members are getting on a bit and can't afford to hang around too long... start collecting, folks! The CD includes the unique, legendary version of Rain-Wheels featuring Pete Atkin as guest vocalist. As for the rehearsal tapes, well - remember that old reel-to-reel tape found in an attic on Merseyside...? Below is a list of the band's gigs archive. We have no information as to further gigs are arranged, but details will be published here as they are announced. 17 July 1999 The Field of Dreams "FoD 99"
There is a review of the Beautiful Changers' performance at the FoD 99 gig on the Pete Atkin website! 21 October 2000 The School of Dreams "SoD 2K"
Visit the Beautiful Changers Photo Gallery to see some exclusive photos of the Beautiful Changers in action! More photos on the Smash Flops - Pete Atkin website of the Beautiful Changers' second rehearsal for the Field of Dreams gig on 6 June 1999, Long Hanborough, Oxon. Listen to The Beautiful Changers here! Now you can hear for yourselves what The Beautiful Changers sound like! All sounds will require an mp3 player (such as WinAmp) to play them. Now you've heard them, take a listen to what they should have sounded like! Vocal: Pete Atkin It was generally agreed that Pete Atkin's version of Rain-Wheels (accompanied by The Beautiful Changers) would probably have been better if the band had played it at a faster tempo. This is what it might have sounded like if they had! Vocal: Pete Atkin Pete Atkin kindly (and somewhat bravely!) invited The Changers up on stage at the end of his final set to accompany him on I See The Joker - this is a taster of what it sounded like. Watch this space for further exclusive sound clips of the band!